From San Francisco and the Peninsula: Take 101 North through Santa Rosa to the Calistoga/Guerneville/Russian River exit. Turn right, proceed straight through traffic light. You are now on Mark West Springs/Porter Creek Road. Continue for approximately 8 miles to the Stop Sign. Turn left onto Petrified Forest Road and continue for approximately 7 miles to the Stop Sign. Turn left and continue on Highway 128 for approximately to Tubbs Lane and turn right (Small market on right). Proceed on Tubbs Lane until Stop Sign and turn left onto Highway 29. Continue over Mount St. Helena through Middletown to Lower Lake. Go straight through traffic light and you will be on Highway 53. Continue on Highway 53 for approximately 9 miles through 3 traffic lights to the Stop Sign. 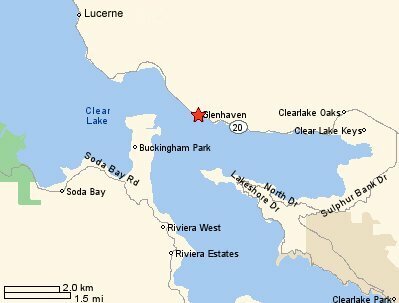 Turn left onto Highway 20 and proceed through Clearlake Oaks to the community of Glenhaven, 3 miles past Clearlake Oaks. As you come into Glenhaven, watch for the Starlite Resort Motel sign on the left side. Just before the Starlite Resort is Harbor Drive. Turn left onto Harbor Drive and follow it to the end and the Sea Breeze entrance. From South Bay/San Jose: Take Interstate 680 North to Interstate 780 Junction and head toward Vallejo to Interstate 80 East and follow as indicated below. From the East Bay or Alternative San Francisco/Peninsula: Take Interstate 80 East to the American Canyon exit, just past Marine World. Exit and make a left going westbound. Turn right at the second stop light (Highway 12/29/Sonoma Blvd.) and continue to the Napa/Vallejo Highway junction and BEAR TO THE RIGHT TAKING THE DOWNTOWN NAPA/LAKE BERRYESSA EXIT (Highway 121). Stay on Highway 121/Soscol Road through several traffic lights and turn right where the sign indicates the Silverado Trail (Old Highway 121/Soscol Road). Continue to the stop sign at Trancas Street and make a left, then an immediate right onto the Silverado Trail. Stay on Silverado Trail continuing straight at the FLASHING red stoplight to the next STOP SIGN (Highway 29 at Calistoga). Make a right staying on Highway 29, continuing over Mount St. Helena through Middletown to Lower Lake. Go straight through traffic light and you will be on Highway 53. Continue on Highway 53 for approximately 9 miles through 3 traffic lights to the Stop Sign. Turn left onto Highway 20 and proceed through Clearlake Oaks to the community of Glenhaven, 3 miles past Clearlake Oaks. As you come into Glenhaven, watch for the Starlite Resort Motel sign on the left side. Just before the Starlite Resort is Harbor Drive. Turn left onto Harbor Drive and follow it to the end and the Sea Breeze entrance. From Sacramento: Take Interstate 5 North just past Williams and exit at Highway 20. Turn left (West) at the Stop Sign. Stay on Highway 20 approximately 50 miles until you reach Glenhaven (5 miles past Clearlake Oaks). As you come into Glenhaven, watch for the Starlite Resort Motel sign on the left side. Just before the Starlite Resort is Harbor Drive. Turn left onto Harbor Drive and follow it to the end and the Sea Breeze entrance. For Yahoo driving directions to Glenhaven, click here!